How do I borrow and share content with users outside of my organization? Subscriptions allow sharing content between organizations. Setting up subscriptions that allow sharing content between organizations requires collaboration between a content provider, a subscriber, and Agilix Support. The subscriber is the organization that would like to borrow content. The content provider is the organization that will share that content. The content is located in the content provider’s Agilix domain. The subscriber is an Agilix customer with a current customer domain. An agreement exists between parties, permitting content sharing. First, the content provider needs access to the subscriber's domain in order issue a subscription. To ensure security, the subscriber must ask Agilix Support to grant them this access. The subscriber’s domain name and ID. The content provider contact’s user name and ID. Please provide [INSERT: content provider contact’s user name and ID] access to [INSERT: subscriber domain name and ID], so they can share content with our organization. Agilix can give the content provider access to the subscriber's domain, but this is not the final step. Once they have access to the subscriber's domain, the content provider can issue a subscription to the subscriber’s entire domain or to select users within that domain. To learn more, visit How do I add subscribers to my domain? or How do I add subscribers to a course? 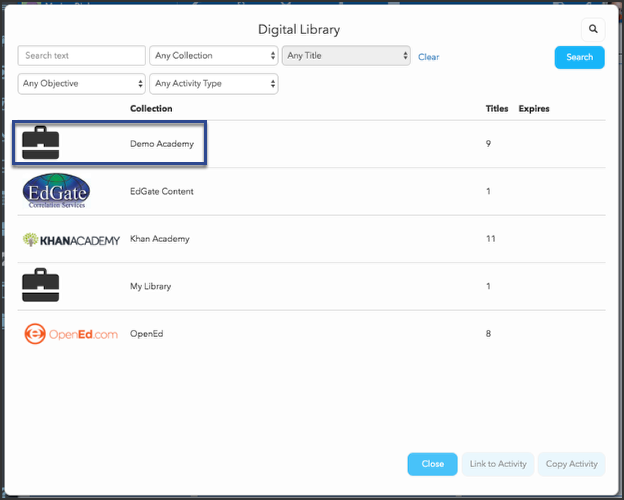 When signed in as a teacher, the subscriber should see the content provider’s domain in their Digital Library alongside content providers like Khan Academy and OpenEd. You can create subscriptions for content within your organization without Agilix's help. Domain subscriptions are inherited by subdomains and courses. How do I add subscriptions to my domain?